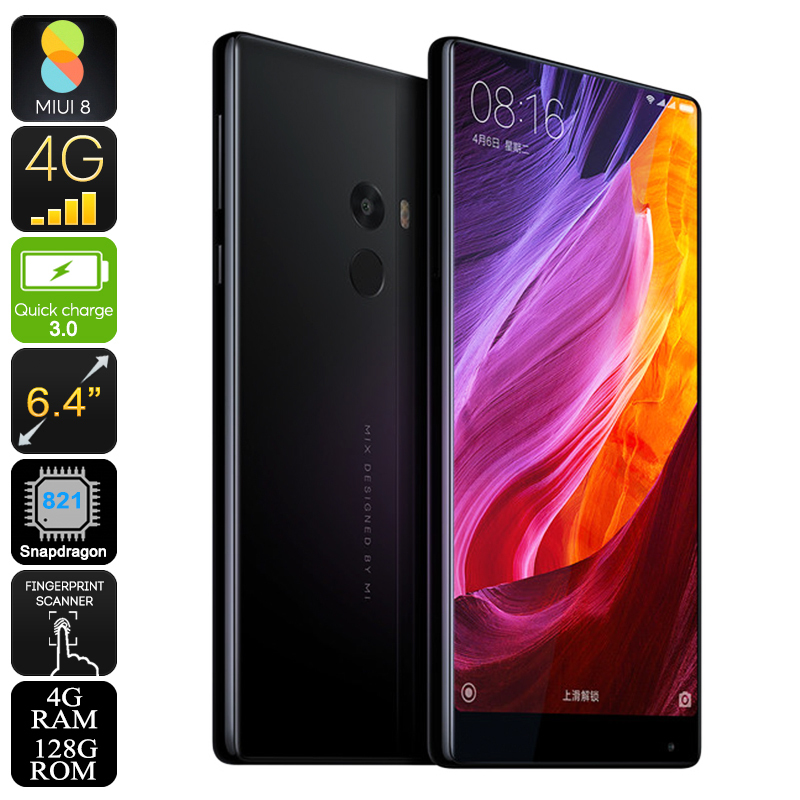 Successfully Added Xiaomi Mi MIX 128GB Smartphone - Bezel-less 6.4 Inch Display, Android 6.0, Snapdragon 821, 4GB RAM, Dual-Band Wi-Fi, 4G to your Shopping Cart. With the launch of the Xiaomi Mi MIX this Chinese smartphone manufacturer has, once again, proven itself to be a world-class player in the industry. Coming with a massive 6.4 inch display, the screen on this bezel-less phone reaches from side to side, delivering a stunning 91% screen to body ratio. The innovative bezel-less Xiaomi Mi MIX gives us a peek into the future of smartphones – bringing an absolutely stunning user experience largely unknown to the industry before. Running on the MIUI 8 operating system that has been based on Android 6.0, this Xiaomi phone brings along a remarkably smooth user experience and all the trusted features that Android users are familiar with. Featuring the powerful Snapdragon 821 Quad-Core Processor that has been clocked at 2.35GHz along with a mesmerizing 4GB of RAM, the Mi MIX is a smartphone that can handle the latest and most demanding software at ease. Whether you enjoy watching an FHD movie, play demanding games, or discover the latest Applications – this Android phone is guaranteed to meet your mobile demands without dropping a frame. Snapping pictures and recording video with this Android smartphone truly is an experience like no other. Thanks to its bezel-less 2048 x 1080 display pictures and video’s can be reviewed in stunning detail. A professional-grade 16MP camera lets you snap breathtaking pictures and 4K video, allowing you to capture all those special moments in life in unbelievable clarity. From now on you’ll be able to carry around a professional camera in your pocket at any time, as with the Xiaomi Mi MIX you have all the means necessary to capture and share beautiful images at any given moment. An unbelievably massive 128GB of internal storage provides you with more than enough space for you to save all your beautiful pictures, media, games, and a whole lot more. At the back of this magnificent smartphone an ultra-fast fingerprint scanner can be found, allowing you to easily unlock your smartphone and securely store all your private files. Dual-Band Wi-Fi and 4G connectivity provide you with the fastest data speeds out there when using the Xiaomi Mi MIX. So head out to the web and stream the latest FHD movies and download files in lightning seeds – with this bezel-less smartphone a slow internet connection will be an annoyance of the past. With its epic 4400mAh battery the Mi MIX offers hours worth of continuous usage time, enough for you to get through the most demanding of days without ever having to worry about running out of juice. The Xiaomi Mi MAX comes with a 12 months warranty, brought to you by the leader in Android phones as well as wholesale electronic gadgets..
Arabic: - الهاتف الخليوي 6.4 بوصة - Chinese Simplified: - 6.4 英寸手机 - Czech: - 6,4 palce mobilní telefon - Danish: - 6.4 tomme celle foretage en opringning - Dutch: - 6.4 inch mobiele telefoon - French: - Téléphone cellulaire de 6,4 pouces - German: - 6,4 Zoll Handy - Hebrew: - טלפון סלולרי 6.4 ס מ - Hindi: - 6.4 इंच सेल फोन - Italian: - 6,4 pollici telefono cellulare - Japanese: - 6.4 インチの携帯電話 - Korean: - 6.4 인치 휴대 전화 - Malay: - Telefon bimbit 6.4 inci - Norwegian Bokmål: - 6.4 tommers mobiltelefon - Romanian: - Telefon mobil de 6,4 inch - Russian: - 6.4 дюйма сотовый телефон - Spanish: - 6,4 pulgadas del teléfono celular - Thai: - 6.4 นิ้วโทรศัพท์มือถือ - Turkish: - 6,4 inç cep telefonu - Vietnamese: - Điện thoại di động 6.4 inch.